If you are on the hunt for the best mattress, you have probably heard of memory foam, but you may not have heard of latex as a primary mattress filling. Latex is one of the most popular choices for those with allergies (bar latex allergies, of course) because is naturally hypoallergenic and breathable. It’s also a very durable material and can be expected to support you soundly for several years. Browse below to find the best latex mattress for you; we've included everything from budget to top-quality ones that ensure you won't over-heat, and latex mattresses that are ideal for allergy sufferers. If you're looking to find the best mattress for your needs, we've got plenty of choice, or if you're after a mattress deal, we've found the best. We recommend going for a medium thickness latex mattress such as the Naturalex GELTECH Mattress if you often find yourself getting hot and sticky in the night. Looking for the right level of support and firmness? To enjoy the best of both worlds, we recommend latex-topped pocket spring mattresses, like our top pick from Rest Assured, which bring a bit of extra bounce to the party. Latex has cooling superpowers, helping to regulate your body temperature via tiny holes in the filling that allow for better airflow. If you have allergies, latex mattresses, like other foam mattresses, are a good choice because the lack of coils or springs means a lack of space for dust mites and their faeces. That's not to say that you will get rid of dust mites completely (see our guide to find out more), but their presence will be significantly reduced. Latex mattresses tend to be much firmer than memory foam mattresses (see our best buys guide to see our round up), but often the firmness will give a little after a month or two, so do allow time to break your mattress before rushing for a ‘help, it’s rock solid’ refund. However, natural latex does provide cushioning for pressure points, such as your hips and shoulders. Need to know more about mattresses? Find out how to choose the best mattress in our practical guide. And check out our best latex mattress pick below to find the one that’s right for you. Who will the Richborough suit? Anyone seeking a really luxurious pocket spring mattress with latex softness. What is the Richborough like to sleep on? This mattress falls on the firmer side of medium, but still offers a good level of cosy comfort thanks to its latex topper. It offers decent support for shoulders and hips, which is great news for side and back-sleepers, and we also found motion transfer was minimal – ie, your partner won’t disturb you during the night. Build quality is unprecedented, and this shines through when you sit on the edge and it stays strong and supportive. Speaking of which, it is a deep mattress, which could prove an issue if you already have a tall divan base. Treated with Purotex, a textile additive that uses good bacteria to stop dust mites and other household allergens from multiplying. Allergy UK approved. Single-side, so no need to flip but it does require rotation. Also comes in soft and firm versions. A pocket spring base (2,000 in a king size), with a latex filled pillowtop for extra comfort. The latex used here is a blended variety, which mixes natural and synthetic latex to achieve all the sleep benefits of 100 per cent natural latex but with the advantage of a more affordable price tag. A five-year guarantee. Delivery is an extra £14.99. See our full review of the Richborough mattress. Who will the Dunlopillo Firmrest suit? Environmentally-aware shoppers looking for firm spinal support. What is the Dunlopillo Firmrest like to sleep on? Light sleepers can be woken by the slightest thing – if you’re too hot or too cold, if the bed squeaks or moves. However, this latex mattress from Dunlopillo is favoured for its firmness, which can help prevent all manner of disturbances, including those from a fidgety partner. It's our best latex mattress for firm support. It has an open cell structure, which makes it incredibly breathable and is also hypoallergenic so you can expect a sound night’s sleep, even in the height of summer. Eco-friendly core. The latex base is engineered into seven comfort zones – softer for cushioning your shoulders, hips and heels, and firmer spine-balancing support for correct alignment. No turn. Made from entirely natural latex derived from the sap of sustainably grown rubber trees, this mattress automatically responds and adapts to individual postures and movements to encourage deeper and more restful sleep. The cover is treated with Actipro to eliminate unwanted allergens, reduce bacteria and unpleasant odours. Free UK delivery within three weeks. Who will the Pocket Latex 2000 suit? Fans of Silentnight’s Mirapocket mattresses looking for extra allergy protection and padding. What is the Pocket Latex 2000 like to sleep on? At 37cm-deep, this mattress means business. The main support is provided by Silentnight’s award winning Mirapocket spring system, whereby each pocketed spring reacts independently to your body weight and movement. The benefits include no roll-together between partners, pressure relief on joints – this is a good option for side and back-sleepers – and maximum sleeping space as the sprung support carries right to the edge. The natural latex layer is generously thick and provides medium/soft comfort levels for those who like a cloud-like nest of a bed. The three Reevoo reviews available give this mattress nine out of 10 overall and agree it is comfortable and well made, if a bit on the bulky side. Treated with Purotex, a 100 per cent natural probiotic that combats allergens and dust mite. Pocket spring base (2,000 in a king-size), with a natural latex filled top layer. Free UK delivery from 14 days, to a room of your choice. A 60-night comfort trial (switch to a different Silentnight mattress if this one isn’t for you). Potential to save £75 when you trade in your old bed or mattress. See our review of the Silentnight Mirapocket Eco Comfort Breathe 2000 mattress. Who will the Sealy Activ Latex suit? Packing springs, foam and latex, there’s something for everyone in this luxurious number. What is the Sealy Activ like to sleep on? If you are sick of your partner's restlessness waking you up, you may find that this latex mattress is firm yet comfortable enough for you both to sleep soundly. This is the best latex mattress for absorbing movements, and this is no doubt partially due to the extra layer of support foam between the pocket spring base and latex layer. All bar one of John Lewis’ customers liked this mattress, rating it 4.4/5 overall. The general consensus is that you get a lot of mattress for your money, not to mention Sealy’s renowned quality construction and comfort levels. The foam layers will add a chemical smell you simply don’t get from latex alone but it does fade in time. Sealy’s clever Unicase foam bolster ensures edge-to-edge support so you’ll never experience that falling-off-a-cliff feeling when you lie near the edge of the bed. No turn. There are a lot of layers to this mattress. From the top down, you have a cosy layer of breathable polyester, then two layers of soft foam, a thicker later of latex, more polyester, then a much thicker support foam layer that’s zoned inline with your body, yet more polyester and, finally pockets springs (1,400 in a king-size). Phew! A 10 year guarantee. Free standard UK delivery within five weeks. Who will the Marcapiuma suit? This is a great quality latex mattress from Italy that will suit anyone seeking medium firmness. What is the Marcapiuma like to sleep on? This mattress is specifically designed with allergies in mind. Alongside the standard anti-allergy protection that latex offers, it features antibacterial protection against the growth of dust mites and, thanks to Silver Ion impregnated cover, is effective against more than 650 different species of bacteria (try not to dwell on that for too long or you’ll never sleep again). The cover can also be easily removed and machine-washed so you can keep your mattress fresh for longer, and the latex base boasts seven different comfort zones with breathable holes to keep you cool at night. It is rated 4.6/5 stars on Amazon, with 85 per cent of the 20 reviews giving it a big thumbs up for coolness and overall satisfaction. Cover is removable and machine washable at 60 degrees. Supplied rolled and vacuum-packed for easy delivery and access. The main ingredient is 100% Latex Foam, a blended material made from natural and synthetic latex for excellent support and longevity. Free delivery within four to five days. A 10 year warranty. Oeko-Tex certification, which basically means there are no harmful chemicals in this mattress. Who will the Sareer Latex Coil suit? Anyone looking to enjoy the benefits of latex for less. What is the Sareer Latex Coil like to sleep on? With even the largest super-king version coming in at just a little more than £200, it’s no surprise that people are snapping this mattress up for their guest bedrooms and children. However, according to the glowing reviews on Wayfair, many have been so impressed that they then proceeded to order one for their master bedroom. Praise indeed. There are a few suggestions that this mattress might tip towards the softer side of medium (open coil springs are generally spongier than pocket) so tread with caution if you prefer things firmer. The springs in this mattress have a coil gauge of 13.5 – look for 12 if you need firm support. Hypoallergenic materials protect against dust mites. The Reflex foam layer features open cell airflow for a cooler sleep. 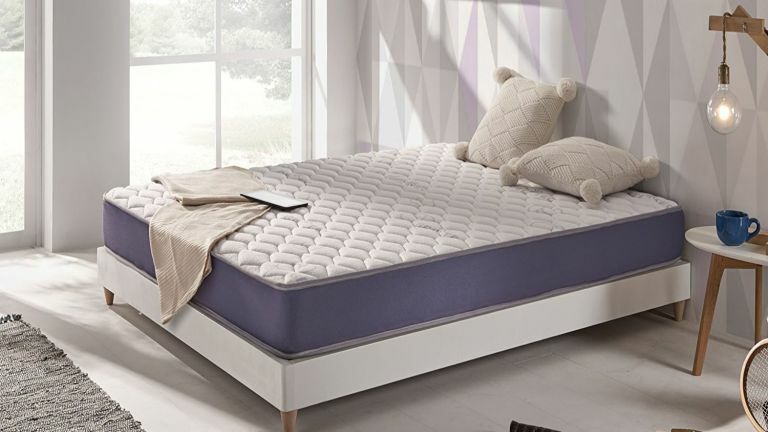 Although the base is open coil, rather than the superior pocket spring option, the extra layers of Reflex foam and latex will undoubtedly give this mattress extra durability. However, do be aware that most open coil mattresses don’t last longer than five years, which is why they are often the preferred choice for children and guest use. Free standard delivery within the UK. Five-year manufacture warranty. Who will the Naturalex Geltech suit? What is the Naturalex Geltech like to sleep on? You can kiss goodbye to night sweats with this gel/latex/memory foam combo, which is designed to regulate your temperature all year round. It has a winter and a summer side that you flip depending on the season, while the seven comfort zones will support your sleeping position to keep you comfortable as well as cool. The mattress itself is not too thick, so is suitable for adjustable beds (set to be a big trend in 2019, you heard it here first), but still provides firm support, which is great for relieving pressure on the joints. The dual-sided cover is pretty clever: thick cotton gives extra cosiness on the winter side, while an aerated 3D mesh cools you down in summer. Supplied rolled and vacuum-packed for easy delivery and access. The latex layer is at the core of this mattress and provides zoned support and spine alignment. This is sandwiched by two memory foam layers, which are gel-infused to help with temperature regulation, according to Naturalex. Free delivery. There are a few sellers of this mattress on Amazon, so do shop around to find the best deals. This is a high-spec crowd-pleaser that tackles all the main mattress crimes head-on. Uniting memory foam, pocket springs and latex, Dormeo’s top-end Tribrid mattress caters for all. Those with back pain will be particularly relieved to hear about the natural latex layer that helps settle your spinal column in a neutral, weightless position, which allows the muscles to relax and repair. Not forgetting latex’s breathability prowess, which wicks away excess heat and moisture for a peaceful sleep. The memory foam, spring and latex combo promises superior motion transfer protection, which is critical when trying to avoid painful bumps in the night. Natural probiotic ingredients injected into the fabric layers help keep allergens and dust mites at bay. Dormeo claims this mattress is eight times more breathable than other foam-based mattresses thanks, in part, to its latex layer.